Manoel was the second son of Don Carlos the King of Portugal and his wife, Marie Amelie, daughter of the Comte de Paris, claimant to the French throne. 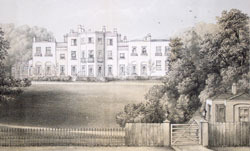 She had been born at York House, Twickenham in 1865. Manoel was born in Lisbon on 15 November 1889, barely a month after his father had succeeded to the Portuguese throne. King Carlos I and his eldest son, Luiz, were both assassinated on 1st February 1908. 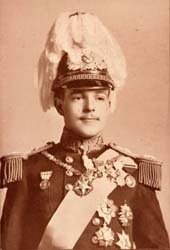 The 18 year old Manoel, in training as a naval cadet, succeeded to the throne as Manoel II. His reign was brief. A Revolution broke out in October 1910. Manoel and his mother fled to Gibraltar and from thence to England. At first they settled at Abercorn House in Richmond early in 1911. Manoel married the German Princess Victoria Augusta of Hohenzolern in September 1913. On their return to England they settled at Fulwell Park in Twickenham. Manoel took a lively interest in local affairs. He supported the Hampton Garden Society and was first President of the Twickenham Piscatorial Society. In 1914 a garden party was held at Fulwell Park attended by Queen Alexandra, Princess Victoria and the Empress Marie of Russia. Manoel was a prominant figure at the Charter Day celebrations of 1926. In 1929 he gave a further £20 to the new Twickenham museum. He opened the fete held in 1931 to raise funds for the building of the new St.Mary's church hall. His Rolls Royce was serviced in the garage in Richmond Rd (now called Orleans Garage). King Manoel was also a keen tennis player and a regular visitor to the annual Wimbledon tournament. On Friday 1st July 1932 he was at Wimbledon. The following day he suffered from a sore throat. His wife and most of the staff were absent for some time. A doctor was called in but the King died of oedema of the throat. After a requiem mass at Westminister Cathedral, the body was moved travelling through Twickenham where the streets were lined by school children, to the church of St.Charles Borremec in Weybridge. There it remained until it could be moved to the Braganza family mausoleum near Lisbon. The couple had regularly worshipped at St James' Catholic Church in Pope's Grove. They were generous supporters of the church and there are reminders of the Orleans and Braganza families there including the window to St.Anthony of Padua bearing the Braganza crest. Fulwell Park was sold in 1934 and later demolished to make way for suburban housing. One curious relic survives - the four ton safe that used to hold the royal jewellery at Fulwell Park is now housed in St Mary's Church, Hampton. Manoel took on the task of writing a scholarly account of early Portuguese printed books. This study ran to several volumes published by Cambridge University Press (the last volume being completed after his death by his young librarian, Margery Withers). Richmond and Twickenham Times and the Surrey Comet archives.